The following is a guest about money makeover. If interested in submitting a guest post please read my guest post policy and then contact me. Bills, mortgage, loans and debts – who doesn’t have them? Without a doubt, only a few are living a peaceful, debt-free life. While the greater majority aspires wealth, I believe that many would want to know the secrets towards a financially stable life. 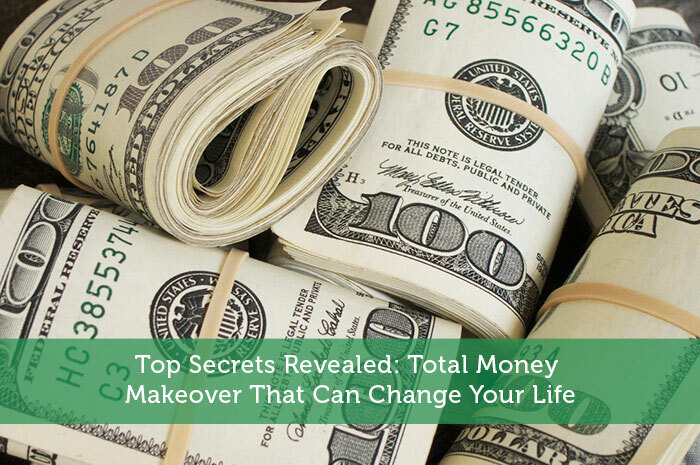 Here are some money makeover tips that will help change your life. Set financial goals and take concrete steps to get there. If you want to be totally debt free in the next 5 years, then you have to begin tracking where you are in relation to your goal. Take the time to go over all the financial obligations you have at the moment. Which loans or debts do you have to pay first? Be sure to prioritize and pay off those with higher interest rates. For sure if you are facing several loans to pay off, you cannot do it in a short period of time. So you need to break down your goal. Smaller and achievable goals will certainly encourage you to pursue and work towards the bigger ones despite how challenging they are. Purchase only what you need, and save the rest. Following the latest trend in fashion and gadgets can be a huge financial drain. Materialism will hinder your path to wealth. In some cases, your job or social standing would require you to keep abreast of what’s in to a certain extent. The internet abounds with stories of people who have successfully implemented minimalist lifestyles that may inspire you to be moderately frugal. Total money makeover tips always include restraint. Set your monthly expense budget based on what remains after setting aside what you want for savings. If you save only what remains after deducting your expenses from your regular income, there will not be much left. If you make a conscious decision to set aside a certain amount each month and only spend what remains, the results will surprise you. Sure, you may have to give up a few branded items for generic ones, but it allows you to inch closer to your goal. The use of the credit card is one of the most common reasons for bankruptcy. Banks literally entice consumers to a life of debt, and then heap lots of interest and other charges on them. While you cannot avoid using credit cards, if you settle your bills every month, the bank has no chance to get their pound of flesh. Another way of avoiding debt is by setting aside portions of your spending budget for the things you want before going off to buy them. This way you know you will not be charged any interest, and stores usually offer discounts for cash buyers. Find a way to earn passive income. There is only one you. If you want to increase your earning capacity, then you have to find a way to earn that does not require much in the way of your physical presence. Investing in stocks, bonds and mutual funds are good options. This allows your wealth to multiply at rates much better than what the banks can give. Investing in a friend’s business is another option. However, this poses greater risks — your friendship among them. Better stick to mutual funds and let professional fund managers grow your money for you. Don’t try to get rich quick. While a few people really get rich in an instant when they win lotteries or receive an inheritance from wealthy relatives, they constitute a tiny majority. Most lottery players die without ever winning a significant amount. You’re more likely to achieve your goal of getting rich using tested, a bit slow, but sure methods. Trying to get rich quick may just get you caught up in one of the many scams. If an offer sounds too good to be true, it probably is. Deal only with reputable stock brokers and mutual fund companies – none of them will offer to double your money in a year, but it’s not realistic to expect them to anyway. These are just six total money makeover tips that involve small changes that virtually anybody can do to improve their financial standing. It just takes commitment, willpower and discipline. Feel free to start now. Really good tips. I especially like ‘Purchase only what you need and save the rest’, a really good moto. In fact it’ll be my next whatsapp status! You are right. In fact, it is something I had to learn the hard way over the years. I believe these are practical tips that can really help anyone change their financial challenges in life. Thanks for the comment! Great tips to win with finances. I think protecting the income we already have is the most important tool to any money makeover. I agree. In fact, I am still learning this lesson every day. Do you believe that in life, any good thing can be taken away from you any time if you are not a good steward of it? I do. “Materialism will hinder your path to wealth.” — Love this! So true. If you are not wealthy but you want to be one day, you’ve often got to give up your love of lots of shiny “things,” at least until you’ve made it!! I agree totally. Thanks Dee, for the comment. I think the 2 biggies on the list (though all are important) are to not try to get rich quick, because it never works and to develop additional sources of income. If you can have extra money coming in, you can invest/save it without even realizing it is coming in. Then you just sit back and watch your account values grow over time. I think saving the “extras” coming in is sometimes a great challenge. It takes a huge effort on your part to really stick to your goal and not “touch” the extras you have — unless of course, you invest it. Great thoughts here, Jon! Paying yourself first is a big one. I personally need to work on my passive income streams. If blogging has taught me anything, it’s that the income is definitely NOT passive. I agree Stefanie. Thanks for sharing your thoughts. Great steps! Most of it starts with being debt-free. You can accomplish so much once you don’t have the weight of debt on your back! Thanks for the post!